Isak Borg (played by Victor Sjöström) is an old retired doctor. Imminently receiving an honorary doctorate in Lund, he decides to take on the journey by car in company of his daughter-in-law (played with elegance by Ingrid Thulin). This drive will turn out to be an introspective and oneiric voyage through which he rediscovers fragments of his own past, witnessing previous moments of his life, by means of dreams and encounters along the road. The dream excerpts express ideas through highly symbolic images and storytelling. This applies in particular to the opening sequence in which he finds himself alone in a deserted part of town, filled with houses in disrepair. Walking down the street, he sees a clock. When taking a closer look he realises it is handless, giving him no indication of time. His heart starts beating increasingly strongly, presumably out of fear caused by incomprehension and apprehension. I assume the handless clock symbolises two things. The first one is that his time as a living being has elapsed, suggesting that he technically doesn’t have any time left, and once dead, time won’t have the slightest importance anymore for him. Death being amongst the most prominent themes in the auteur’s oeuvre, with most notably The Seventh Seal, which came out in 1957 as well. The second one is that the clocks’ hands disappear while he is dreaming. Time and its flow are in discordance with “reality” in a dream. Time, and by that I mean the sensation of time, can be elongated, shortened, or even stopped. For instance, we all experienced waking up in the morning and feeling that the dream we just had lasted for 10 minutes, where in fact the whole night went by. Consequently, knowing what time it is, in a dream, would not necessarily be an accurate or reliable indicator of the present moment’s situation. Below the clock are two eyes, alluding to the surreal dream sequence designed by Salvador Dalí, for Alfred Hitchcock’s Spellbound. In this same dream, when he finally perceives what looks like a human silhouette, he approaches and gently touches its shoulder. It turning around, what Isak sees is a ghost, mirage of past human life. Moments later, a carriage without conductor comes down the street, carrying a coffin inside of which is Isak Borg’s own cadaver. After falling off the carriage, the coffin opened itself, the hand of his corpse gripping him and trying to pull him inside, once again a prophetic symbol of his impending death. This scene was perhaps a reference and homage to Victor Sjöström’s film The Phantom Carriage. Sjöström whom Bergman made part of his homage to him. 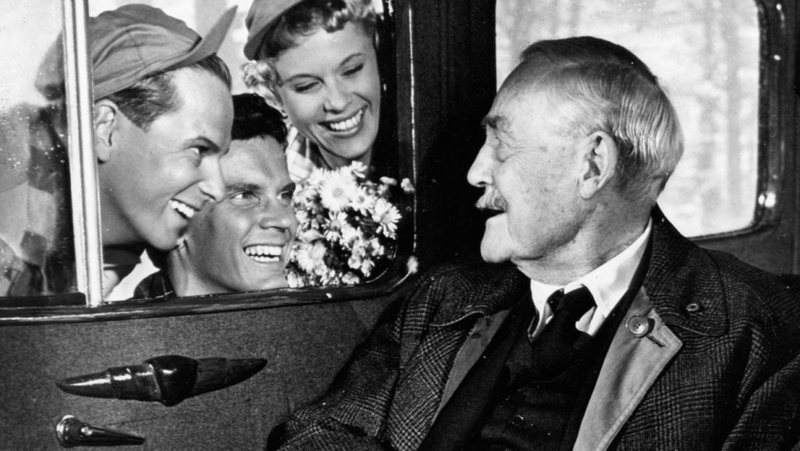 Through this act and choice, the director was repaying his debt to one of his spiritual fathers, which further revealed that each of Ingmar Bergman’s films are deeply personal, and Wild Strawberries is certainly not an exception. Indeed, a theory enunciated by many critics was that the father in the film might have actually been a representation of Bergman’s own father. In this story, the notions of time and space see their classical arrangement de-constructed and rearranged, in such a way that puts dreams and reminiscence of the past as the guiding thread. The narration oscillates between dream and reality, with the blurred and undefined border between those two elements, giving this picture an out of time, nostalgic tonality, and helping Doctor Borg visit his unconscious, before it is too late. A dream could perhaps be referred to as a time machine in this narrative. By letting himself be sentimental and open in the recollection of his past, Isak Borg was able to see past episodes from his life with discernment. Even though some remembrances were painful and somehow humiliating at times, they proved to be purposeful, making him more lucid and self-conscious. He was now able to let go.